The Ultion 3* Kite-marked Cylinder and the new Lock Lock products are now available from Climatec, offering you the best in home security. Customers are now able to purchase Climatec doors with the Ultion 3* Kite-marked cylinder. The Ultion cylinder meets the highest TS007 standard (3 star) without needing to be bolstered with support of cylinder protectors or extra secure door handles. It has also achieved Sold Secure Diamond status, making it one of the most highly accredited lock systems ever manufactured. If a break-in is attempted, the Ultion detects the forced entry and activates Lock Down Mode; an attack lock directly into the central cam. If the intruder is determined and does manage to get past Ultion’s two sacrificial sections he won’t get to the attack lock because it is protected deep inside a solid molybdenum core and secured with a dedicated retaining pin. The householder can be assured that when Ultion is in lockdown mode their home and family are safe. Furthermore, if an intruder does snap an Ultion lock and breaks into the home, Ultion have guaranteed to pay £1,000. Double cylinders, thumb turns and keyed a likes are available from Climatec. 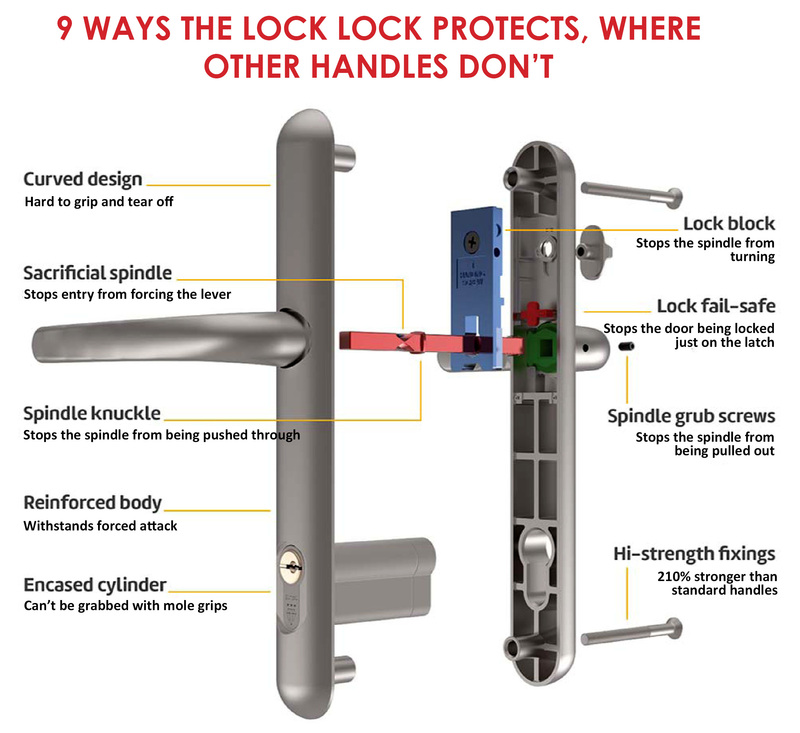 The Lock Lock security handle has a patented lock-block that stops the spindle turning. A clever switch on the handle also removes the need for a key on the inside and furthermore a luminous indicator lets you know that the door is indeed securely locked. With this security handle the home is “locked and locked”, meaning double the protection for the homeowner. Just lift the handle to engage the hooks and flick the switch to give you peace of mind with this extra layer of protection. Whilst the Ultion 3* Cylinder is the most secure on the market, if this is tampered with and does get compromised, the Lock Lock remains secure and will not allow entry into the home.